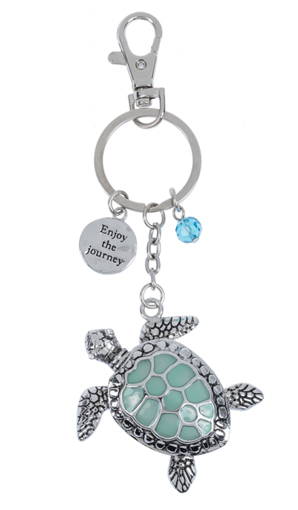 Home > Ganz Key Rings, Keychains, Luggage Tags > Ganz Key Rings, Keychains - Turtle "Enjoy the Journey"
This Ganz Turtle key ring is made of sturdy zinc embellished with colored enamel. It has a glass bead dangling mini charm, and a message charm that says "Enjoy the Journey". These keychains make wonderful graduation and hostess gifts. They can also be used on back packs, diaper bags, purses and more. ♥ Has 1 glass bead dangling mini charm, and a message charm that says "Enjoy the Journey"